The level is so high here (individual technique and musical understanding) that freedom is never at the detriment of melody and chords. 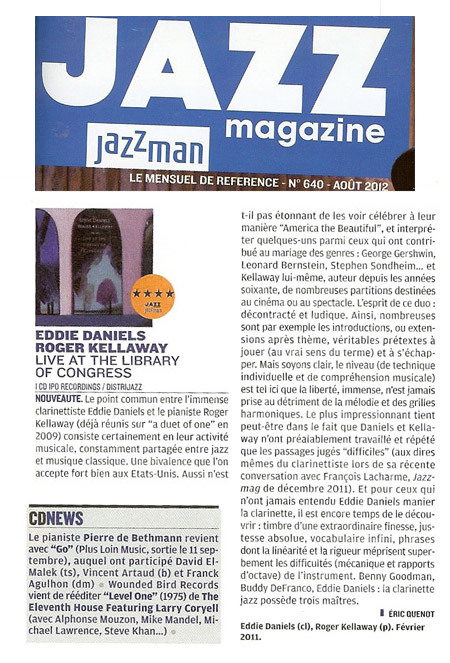 The most impressive is maybe that Daniels and Kellaway just rehearsed difficult passages (cf interview by François Larcharme in Jazz Magazine, Dec. 2011). And for those who never heard Eddie Daniels on a clarinet, it is still time to discover him: an extraordinary fine tone, absolute accuracy, infinite vocabulary, linear and rigorous musical phrases that overpass the technical difficulties of the instrument (mechanics, octava changes). Benny Goodman, Buddy de Franco, Eddie Daniels: jazz clarinet has three Masters. First a program technicality - I do not know if the tune should be "'that's For Afta" or "That's Fa Afta". I wrote them exactly like they appear on the CD notes. When you have a live performance, excellent recording and tremendous players all coming together it is noteworthy. That is exactly what you have in this two CD package. The result is one of those recorded experiences you hate to put down.. I have played this two record package many times and, folks, it only gets better. These five men do not consist of a band that works together regularly yet they have great regard for each others' skills and have the cars to blend together to make jazz the miracle that it can be at its best. 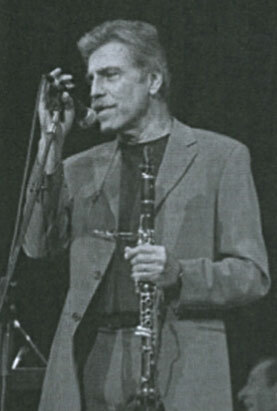 First, Eddie Daniels - he not only plays his customary clarinet but also the tenor sax. Lest you forget, he once was a member of the Thad Jones-Mel Lewis aggregation and in that band he played a lot of tenor sax. He knows his way around on that instrument and uses it with great results many places in this setting. Unless you have been off the planet for a long time, you will know that he is THE clarinet player at this time. Tom Ranier is one of those pianists who just knows how to swing and when he accompanies just knows what to put down and what to leave out. He has several solos and uses them to great advantage. The bassist, Dave Kinck and the drummer Joe La Barbara do get solo space. The latter several times in trading 4's and 8's with the front line. Both could be described as very tasty in their playing. They are right there backing the front line without failure. Put it altogether and you have a band that just excels. I wish I could have been there to hear them in person. The tunes are varied and this review will not get into all of them but several need to be described as best as one can do such a thing with great jazz. "That's For Afta" or "That Fa Afta" (whichever) is a takeoff the tune "After You've Gone" and do they ever take off. This recording has both the full version and at the end of the second CD an edited edition for radio play. Wow is the best way I can describe this tune. Two tunes, "Falling In Love With Love" and "Night and Day" are taken down the musical highway over 100 mph. They really take off on what is often a ballad setting but not here. There are several references to the Modern Jazz Quartet including Roger Kellaway's tune "Deja VU MJQ" and also "Django" The latter is, to me, the highlight of the session. The Duke Ellington tune "Warm Valley" is taken at a moderate tempo and really reflects the title, warm. All in all, a great recording. I close as I began, an excellent live recording, very well recorded, beautifully packaged with fine notes by Ira Gitler plus some marvelous photographs of all the members of the band. I urge you to go out and grab this one. Great straight ahead jazz. It doesn't get any better than this and you can get it yourself at iporecordings.com.